We're still busy redecorating the house and it feels like it's neverending :( Chris has been doing the majority of it but I'm feeling guilty because it's not fair on him so I'm helping him out where I can. It is putting pressure on my lower back though and I have had some weird cramping pains there. I've found that whenever I'm walking I'll get stabbing pains in my pelvic region which does make me yell out and take my breath away. Poor Chris keeps thinking the baby is coming! My hands and feet seem to be swollen a little bit too. Not to the extent that they were in my last pregnancy (plus I'm testing my urine with Ketostix regularly so no pre-eclampsia!) but I'm not liking sausage toes and fingers! I've started to wash all the baby's clothes this week so they will be ready for her arrival. Not long now! The baby now weighs around 2.4kg and measures roughly 46cm. She has full length toenails and fingernails and a fully developed pair of kidneys. Her liver can now produce some waste products too! 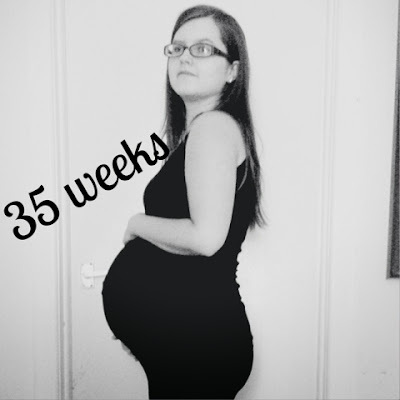 1 comment on "My Second Pregnancy: 35 Week Bump Update"